Are you looking for how to check Glo data balance online? They are various ways that one can check Glo data balance. Today I will be sharing with you fast and easy ways to check your remaining data subscription balance. Glo communication network is the largest indigenous communication company in Nigeria. With their cheap data plan offer, they gather much population of the country’s subscribers. Over the years Glo have been improving on their communication and networking system. All deeds are to reach their customers demand and meet their target. From my see, Glo will be taking over Nigeria Telecommunication world but only if they solve their unstable network problems in most parts of the country. They are four ways to check Glo data balance, but my major focus is based on how to check Glo data Balance online. Let’s see how to do it…. Checking Glo data plan online is done via their main website. 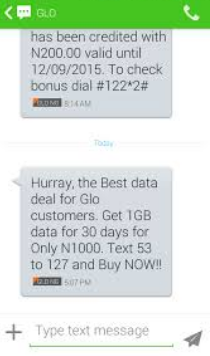 You can check your remaining data subscription by visiting his.glo.com and click on menu. Then navigate to the check data balance. Follow the procedures involved. They are still other ways to check Glo data balance if the online method did not work for you. Yea, you can get your remaining data subscription balance simply by sending few letters on your mobile phone. For you to check your data balance via SMS, simply text “INFO” to 127. There after you will receive a message containing your remaining data balance and expiring data. It pops up again, reply “4” Check data balance and send. Now you will receive a message with your data subscription details. Hey, this method is super cool no much stress. The message can as well be saved. Checking your Glo data balance is cool. All mentioned above are easy ways to check your Glo data subscription balance. But I prefer checking my data balance online so I opt for the first method. Now I know you have learnt how to check Glo data balance online. Don’t forget to share with friends and Endeavour to leave a comment below.